Reflective practice is an essential part of medical education and practice, yet students and teaching staff often struggle with this core competence. There is an acknowledged risk, that unless well managed, reflection can become mere performance under surveillance or simple box-ticking. Creative pedagogy offers one means to introduce students to reflective practice in meaningful fashion, but often sits well outside mainstream medical curricula. 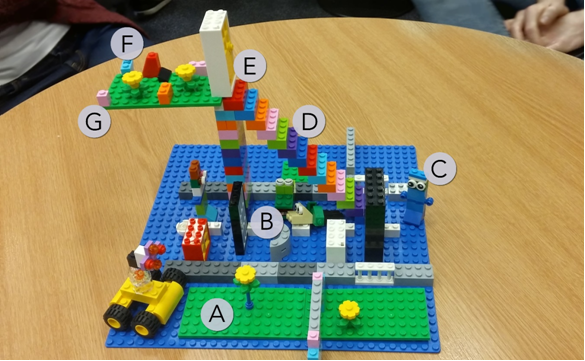 In this paper, we introduce the concept of LEGO® SERIOUS PLAY® (LSP) as a means to channel students’ creativity and break down boundaries and preconceptions regarding reflective practice or any other abstract concept. Drawing on examples from our own practice, we demonstrate the depth and breadth of engagement from students, and demonstrate positive feedback and impact on learners. We reflect on the development of this methodology across three years of implementation, and discuss both anticipated and unexpected facets of this work. Creative pedagogy, as exemplified by LSP methodology, has significant potential to disrupt the orthodoxy of biomedically-focused medical education. This empowers learners to ‘think outside the box’, thus enriching their learning experience. Creative pedagogy of this sort is likely to have multiple similar applications in a wide variety of higher education settings. The term ‘reflection’ has different meanings and is interpreted by curriculum designers in different ways. Our working context is a United Kingdom (UK) medical school, on the island of Ireland. Medical students are expected to begin a journey of reflective practice in their first year which will continue throughout their careers, for professional development and regulatory requirements (General Medical Council, 2018). It is widely accepted that medical students and doctors find reflective practice challenging and unfamiliar (Driessen et al, 2005). Yet, there is little evidence of a critical approach to educating students, and indeed training educators, to match the fast pace of implementation of reflective practice (Mann et al, 2009). There is a risk with the dual and sometimes conflicting aims of reflection (developmental and regulatory) that educators inadvertently promote ‘tick boxing’ to satisfy accountability, rather than promoting insightful, empathetic professionals. Macfarlane characterises reflection as an example of ‘emotional performativity’ and a potential threat to student freedom (Macfarlane, 2016). Bringing diverse skills and knowledge together in our team of educational developer and clinical academics, our teaching philosophy is that of a critical constructionist approach. Our previous experiences with creativity took the form of digital artefacts and interactive clinically based teaching sessions. 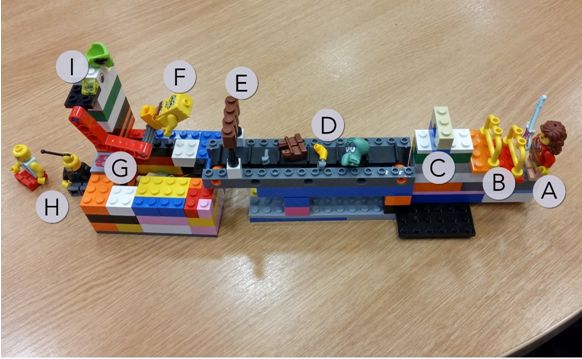 However, with the basis of our creative pedagogy firmly rooted in educational theory, we translated LEGO® SERIOUS PLAY® (LSP), already popular in other tertiary education and corporate settings, to guide students towards a deeper understanding of reflective practice (James, 2013; Nerantzi and Despard, 2014; Peabody and Noyes, 2017). The technique can be expanded for any abstract concept, as we discuss below. We specifically introduce the concept for reflective practice and to encourage creative approaches to team working and introductions in a fun, safe environment. This article will share our experiences of embedding an LSP workshop into an undergraduate programme. Our five-year undergraduate medical programme has an annual intake of approximately 270 students. This student body is becoming ever more diverse with increasing numbers of postgraduate and international students. The curriculum is extremely demanding; year on year additional elements are incorporated, yet rarely can anything be removed. The emphasis, particularly in the early years, is predominantly on biomedical science. Both staff and students can perceive anything beyond this as irrelevant, less rigorous and undeserving of effort and resources. Despite timetabling and resource pressures, we have successfully designed and implemented our workshop over three successive academic years. We facilitate, in pairs, 90-minute workshops involving between 30 and 35 learners. This means nine workshops each academic year, giving us experience of 27 workshops (more than 800 participants) to reflect on. We used large participant numbers as an opportunity to create a variation on formal LSP methodology to suit the setting. Students arrive to higher education naïve to reflective practice. We sought to provide appropriate exposure, preparation and development of this nascent academic literacy. In year one of our workshop, despite enthusiasm and knowledge, we were ourselves naïve about how to best apply LSP, while students were naïve about reflective practice. 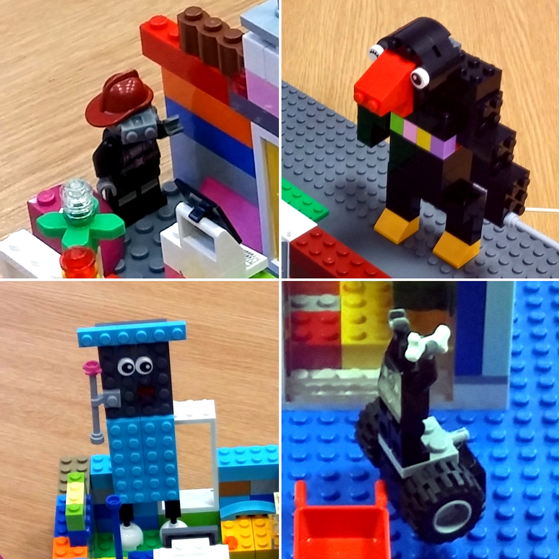 Aiming to harness creativity for learning, we researched approaches around design and delivery of LEGO® workshops using resources from the Higher Education Academy (HEA) (James, 2013). We achieved funding to buy six basic LEGO® sets and augmented this with our own to provide sufficient bricks per group. It was fascinating to watch as students realised that some tables had more complex pieces. Our workshop concept has evolved over three years and will continue to do so. The basic premise begins with an individual build; only confident participants share with the wider group at this stage. The second, longer build is a group activity with a larger construction, such as depicting the journey from student to doctor. In 2018, our team lead successfully gained LSP facilitator accreditation. This strongly influenced the design of our most recent workshops, as we increased the level of challenge, aiming to improve flow. By flow, we refer to an activity structure achieving optimal learner engagement, during which learners lose themselves in the moment (Csikszentmihalyi, 2014). We introduced a much shorter ice-breaker: as per LSP suggested format, this took the guise of ‘the tallest tower in 60 seconds, topped with three red bricks’. We then rewrote the individual build task, focusing on why students wanted to study medicine, rather than the previous more open task of ‘representing themselves’. This article deliberately will not focus on these builds: they are deeply personal and therefore identifiable. The current format concludes with a group build in teams of six to eight. It is these builds, and the rich storytelling that arose from them (as encouraged in the LSP methodology) which we will share. The initial workshops with first-year medical students focused on professionalism and reflective practice. Positioned mid-academic year, they gave students the chance to take a breath and reflect on an intense period of learning and cultural socialisation in a safe, open, low stakes environment. Not only were we able to draw students into reflective practice around their hopes and fears for their future in medicine, but we enhanced their integration with peers and staff. This was particularly cogent given the high number of students from outside Northern Ireland. The content of the workshop is quite literally built by participants, incorporating live photographs, which we project digitally, enabling real-time feedback and discussion. We are very aware of privacy concerns surrounding digital artefacts and ensure that students are never identifiable. The detail and scale of builds have been overwhelming in nearly every case. Some groups build high and precariously, others build across the whole table, some groups curate mini-builds to create a bigger narrative. Many builds are deceptively straightforward but hide a wealth of complexity. We have chosen three types of these group builds as illustrations and whilst the stories below are not verbatim, they are as told to us during the workshops by participants. The build in figure 1 exemplifies many that invoked a height metaphor for the journey through medical school. It contains literal elements as well as some more abstract. Beginning at the front, the area outside medical school is open, clutter free, green and natural (A). Moving behind the grey walls into the study space, bricks become haphazard, cluttered, less anchored, each representing perceived hurdles to be navigated (B). Several pairs of eyes survey this setting from all directions (C). The steps upward convey the sense of having to climb steeply to graduation (D) which involves a final hurdle of getting through a closed door (E). Once through, the landscape immediately returns to green and natural for their celebration (F) before plummeting over the precipice into the unknown world of professional practice (G). The more linear build in figure 2 is an example of a complex and abstract depiction of the medical school journey. The student arrives full of individuality and colour, represented by the guitar (for hobbies) and colourful outfit (A). Once over admission hurdles (B), they are squeezed through a small opening to enter into the medical school itself (C). The school is devoid of colour and is comprised of a conveyor belt, along which the students are deconstructed into component parts (D). Passing the last hurdles of their final exams (E) they become uniform and uni-coloured (F). Graduation involves being flung (the orange lever was mechanical) (G) into clinical practice where they become jaded and exhausted (H). The switch/antenna on the doctor’s head constructs them as an automaton. Again, eyes appear, this time also including a monster looking down from a height to monitor the entire scene (I). The scene in figure 3 depicts ideas of what medical school might involve from the perspective of students on their second day of a five-year course. The task for this group differs from those above in that students are building how they think medical school will be. They bring knowledge with them, yet this remains a ‘figured world’ - an imaginative, idealised rendering of the world (Holland, Lachicotte, Skinner and Cain, 1998). There are four quadrants at the base of a tall tower A-D. The first shows a group of non-medical students engaged in fun, campus-based activities in full colour (A). In contrast, the monochrome space on the right (B and C) represents the clinical environments (including the university-based dissection room and the hospital ward) which are separate from the main campus. The black figure shows the isolation of encountering human cadavers for dissection, visualising their anxieties around this. Finally, the student is studying in isolation at a desk in their bedroom (D). Another student is literally banging their head against a brick wall. The tower again depicts the slippery, tall height the student must scale to graduate (E). The inexperienced, small student at the bottom is reaching up in aspiration (F), whilst the larger more knowledgeable, graduate is looking down (G). From the outset we expected all participants to enjoy the sessions as a more relaxed, non-knowledge transfer focused activity within their hectic timetable. We presumed that reflection would shine through the stories around the builds even though we were not explicitly asking the students to reflect (as per LSP methodology). We knew, however, that this educational approach might be perceived as unconventional. We were taking a risk introducing such a left of centre approach (Kleiman, 2008). Medical students are highly competitive and strategic. This worry was compounded by the fact that the success of the workshops themselves rely on participant engagement. What would we do if there was no engagement? Many students were surprised that LEGO® actually meant LEGO® rather than it being a medical acronym! That students were out of their comfort zone was demonstrated by defensive statements such as ‘I’m not creative’, yet in nearly all cases the stories behind these students’ builds were incredibly detailed and rich. Throughout the workshops we continually took care to emphasise that stories were the most important aspect and that the builds were simply tools. Following the success of the first iteration, seeing the potential of the approach to facilitate introductions and students to learn more about one another in a structured, safe environment, we moved the workshops to induction week at the beginning of year 1. Getting to know one another was therefore another outcome that we were confident would be achieved in every workshop. Leaning in was something described in the literature on LSP, but it was something that none of us had seen ever happen so quickly or naturally in a workshop setting in higher education. We did worry that some students would simply sit it out but this has only happened twice; once in the very first workshop, where after some very quiet and gentle persuasion the individual joined in and went on to produce very simple builds with rich stories behind them. The second occurred when a whole table group displayed minimal engagement and didn’t seem to be having fun or even chatting with one another. It came to light half way through the session that they were all graduates of the same degree course within the institution and therefore knew one another. We have made sure since that group members have not previously met. We are constantly amazed by the depth and creativity displayed within student builds. No two are ever the same. The simplicity of the builds frequently belies the complex stories behind them, which surprised not just us but the students themselves. Many times, when probed further about their build they revealed things that they hadn’t even realised they were consciously thinking about. One of the richest and unexpected outcomes from all iterations of the workshops was the high level of student reflection engendered through the sessions. Throughout every single workshop we were struck and humbled by the openness and depth of honesty from the students, in some cases highly emotional and personal. This may be explained in part by the LSP methodology but also possibly because we are not directly assessing the reflection (Hargreaves, 2004). Across the workshops, it became clear that students had an extremely negative perception of the current accountability discourse in medicine (Hodges, 2006), which they constructed as embodied by the General Medical Council (GMC). This manifested in builds such as monsters, black solid brick walls, deconstructed students on a conveyor belt and black knights (figure 4). It is notoriously difficult to get students to speak freely on such matters, yet this opened up frank discussions addressing challenges of medical training that otherwise would not have taken place. We fed this outcome to senior management who redeveloped teaching sessions in subsequent years. Fear of isolation within medicine appeared in builds at the beginning of Year 1 to our surprise, whereby facilitators were able to steer the discussions towards managing professional challenges and signposting institutional support sources (figure 5). Most recently, we witnessed the power of the methodology to encourage team working, even where students had not been instructed to do so. During the individual task, almost instantly the tables worked as teams to create even taller towers than would have been possible on their own. In this workshop, the students were complete strangers to each other. The therapeutic nature of a break from intense didactic lectures was highlighted frequently in the student feedback following the first iteration. In a parallel vein, new students in the second and third iterations acknowledged that the approach helped allay their fears around commencing medical school. The level of concern about medical school and the future beyond was somewhat shocking to us as educators. However, it was equally wonderful to see how much was gained from discovering they weren’t alone in their worries. It also gave us opportunities to discuss in detail the various support systems available. We found that hands-on work with the bricks helped here, and also that students enjoyed the noise produced. The box was emptied with a joyful loud whoosh, and we gauged the rhythm of the room by the noise of the construction. When the distinctive noise of the bricks settled to silence we knew that it was time to move to the storytelling aspect. These unexpected and expected outcomes are reflected in the student feedback in table 1. As reflective practice increases across higher education and continuing professional development settings, it is crucial to gain a deeper understanding of nuances required for different reflective tasks (Ross, 2011). Sandars believes that an ‘understanding of the educational benefits of reflection requires appreciation of both its theoretical and practical aspects’ (Sandars, 2009). Without this understanding, reflection can result in utilitarian, surveillance-orientated and prescriptive practices (Ross, 2011; Hodges, 2015; Ng et al, 2015). As LSP methodology proposes, our experience overwhelmingly encourages student engagement. Students ‘lean in’ throughout the build activities. 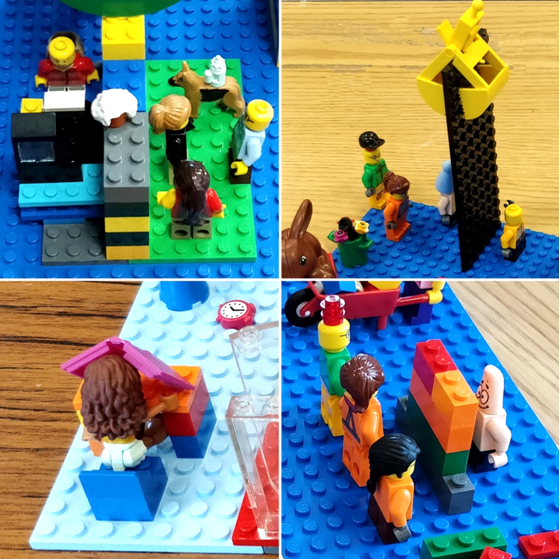 Through working with their hands and connecting 3D bricks together into tangible, visual metaphors, students were able to reflect deeply about their identities and their prospective journeys through medical school. In every workshop, there was an instant buzz in the room as they emptied the boxes of LEGO® onto the table and enthusiastically engaged with the bricks. Potential future research might delve into the differences between this story-based, verbal reflection and traditional text-based formats. International and introverted students are particular groups of interest, as we witnessed many instances of one student relaying the story of another student, giving voice to what would otherwise have remained unsaid. Embracing the methodology, we have transferred it to other scenarios for staff and students, for example to encourage creativity in teaching, overcome writing barriers, explore professional identity and team working. We are effectively engaging ‘creativity – as a positive yet disruptive, disorienting force’ (Kleiman, 2008, p. 215), each of us becoming comfortable with uncomfortable. Within medical education, creativity can be rare and indeed actively discouraged. 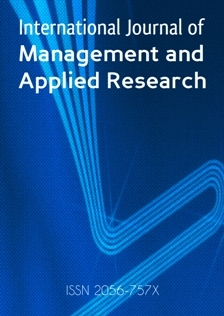 Where it does exist, the focus is mainly on clinical skills and problem-based learning (Lippell, 2002). We hope our experience will add to the literature base highlighting the educational benefits of play in formal teaching (Nerantzi and James, 2015; Gauntlett, 2018; Whitton, 2018) and provide a new lens through which to view reflection within the medical curriculum. LEGO, SERIOUS PLAY, the Minifigure and the Brick and Knob configurations are trademarks of the LEGO Group, which does not sponsor, authorize or endorse this academic work by Clare Thomson, Jennifer L Johnston, and Helen Reid, Queen’s University Belfast, United Kingdom. Csikszentmihalyi, M. (2014), Flow and the Foundations of Positive Psychology, Dordrecht: Springer Netherlands. Gauntlett, D. (2018), Making is Connecting, 2nd ed., Cambridge: Polity Press. General Medical Council (2018), Outcomes for graduates [Online] Available From: https://www.gmc-uk.org/education/standards-guidance-and-curricula/standards-and-outcomes/outcomes-for-graduates [Accessed on 28 Oct 2018]. Hargreaves, J. (2004), “So how do you feel about that? Assessing reflective practice”, Nurse Education Today, Vol. 24, No. 3, pp.196-201. Holland D, Lachicotte W, Skinner D, Cain C. (1998), Identity and agency in cultural worlds, Cambridge: Harvard University Press. 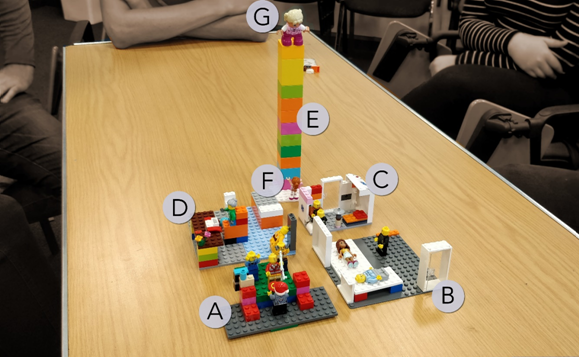 James, A.R., (2013), “LEGO SERIOUS PLAY: a three-dimensional approach to learning development”, Journal of Learning Development in Higher Education, No. 6, pp. 1-18. Nerantzi, C. and James, A. (eds) (2015), Exploring Play in Higher Education, Creative Academic Magazine Special Issue, [Online] Available from: http://www.creativeacademic.uk/uploads/1/3/5/4/13542890/cam_2a.pdf [Accessed on 7 Dec 2018].